^ 1.0 1.1 UEFA Champions League – Real Madrid v Liverpool – Overview. UEFA.com. Union of European Football Associations. 2018-05-26 [2018-05-26]. （原始内容存档于2018-05-28）. ^ 2.0 2.1 2.2 Tactical Line-ups – Final – Saturday 26 May 2018 (PDF). UEFA.com. Union of European Football Associations. 2018-05-26 [2018-05-26]. （原始内容存档 (PDF)于2018年5月27日）. ^ 3.0 3.1 Kyiv to host 2018 Champions League final. UEFA.com. Union of European Football Associations. 2016-09-15 [2016-09-15]. （原始内容存档于2016-09-16） （英语）. ^ 2007–08 season at UEFA website. UEFA. 2018-05-02 [2018-05-02]. （原始内容存档于2018-05-03）. ^ Spain 4 Italy 0 Match Report. Guardian UK. 2012-07-01 [2018-05-02]. （原始内容存档于2018-05-03）. ^ Facts & Figures. NSC Olimpiyskiy Stadium. [2018-05-26]. （原始内容存档于2012-07-12）. ^ 2018 UEFA Champions League final: Guide to Kyiv. UEFA. [2018-05-26]. （原始内容存档于2017-10-21）. ^ 8.0 8.1 2018 UEFA Champions League final ticket sales launched. UEFA.com. Union of European Football Associations. 16 March 2018. ^ 2018 UEFA Champions League final ticket sales launched. UEFA.com. 16 March 2018. ^ All you need to know about the Champions League final. UEFA. 2 May 2018 [3 May 2018]. ^ Champions League final: Liverpool v Real Madrid resale ticket prices 'ridiculous'. BBC. 21 May 2018 [3 May 2018]. ^ Milorad Mažić to referee Champions League final. UEFA.com. Union of European Football Associations. 7 May 2018. ^ 13.0 13.1 13.2 13.3 13.4 Palmares for Milorad Mazic. Worldreferee. 7 May 2018. ^ Saffer, Paul. Three in a row: Real Madrid making final history. UEFA.com. 2018-05-01. （原始内容存档于2018-05-02）. ^ Grez, Matias. Liverpool see off spirited Roma to reach Champions League final. CNN. 2018-05-02 [2018-05-26]. （原始内容存档于2018-05-27）. ^ Club facts: Liverpool. UEFA.com. 2017-06-02 [2018-05-26]. （原始内容存档于2018-05-27）. ^ Johnston, Neil. Roma 4-2 Liverpool. BBC Sport. 2018-05-02 [2018-05-26]. （原始内容存档于2018-05-26）. ^ Corrigan, Dermot. Champions League final repeat of 1981 shows tables have turned at Madrid, Liverpool. ESPN. 2018-05-25 [2018-05-26]. （原始内容存档于2018-05-27）. 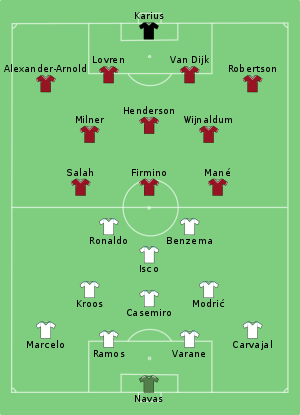 ^ Real Madrid v Liverpool: detailed head-to-head. UEFA.com. 2018-05-03. （原始内容存档于2018-05-05）. ^ Semi-final and final draws. UEFA.com. Union of European Football Associations. （原始内容存档于2017-10-12） （英语）. ^ Full Time Report Final – Real Madrid v Liverpool (PDF). UEFA.com. Union of European Football Associations. 2018-05-26 [2018-05-26]. （原始内容存档 (PDF)于2018-06-03）. ^ 22.0 22.1 22.2 22.3 Milorad Mažić to referee Champions League final. UEFA.com (Union of European Football Associations). 2018-05-07 [2018-05-07]. （原始内容存档于2018-05-07）. ^ Regulations of the UEFA Champions League 2017/18 Season (PDF). UEFA.com. Union of European Football Associations. 2017-04-04. （原始内容存档 (PDF)于2017-10-31）.